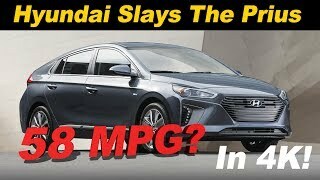 Till date we have seen numerous Hybrid models landing in this automotive world, however none of them proved their competence level in front of the Toyota Prius. Well at the 2016 Detroit Auto Show scenario changed when Hyundai unwrapped their Hyundai Ioniq 2017. The model features an all-electric drivetrain in addition to the hybrid and plug-in hybrid setups that we received with the former model. 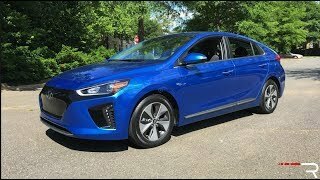 I know it does sounds interesting; let us have a look at the review of Hyundai Ioniq 2017 to know in detail about it. The interior of Hyundai Ioniq 2017 is attractive with all its decent setup. Starting with the flat bottom multi-function three-spoke steering wheel that hides the TFT instrument cluster behind it, we’ll be moving to the infotainment system. Talking about the cluster, it has several gauges that display vital information like, speed, battery and fuel. The interesting thing about the cluster is that it changes the color depending upon the driving mode. The infotainment system uses a seven-inch touchscreen sitting amidst the vents. The system is equipped with Apple CarPlay and Android Auto featuring access by connecting devices and using the navigation. The interior isn’t just about technology; company has taken utmost care of the comfort also. The major highlight in this is the Eco-Driving System that will assess the driving route and also guide about the traffic status through satellite navigation. Thus rounding up the interior details of Hyundai Ioniq 2017 I would say, it is comfortable, tech oriented and has looks to mesmerize. Just like the interior, exterior of Hyundai Ioniq 2017 carries a decent look (not dull) rather than opting an aggressive stance. Starting with the front, model has a conventional nose amidst the slim headlights. The headlights and wheels feature a blue lighting that adds commendably to the looks. The same essence is also carried forward to the lower lip and the side ducts making the fenders look more attractive. The latter comes integrated with daytime running lights. At the rear end things are pretty simple. Company opted for black bumper at the rear rather than going for the body colored one. The taillights take the same slim stance like than of headlights; however they are more of C-shaped. Apart from these, rest all remains pretty simple, yet attractive. 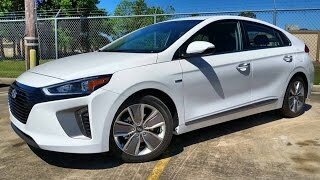 So rounding up the exterior details of Hyundai Ioniq 2017 I will call it a decently interesting and attractive design language that doesn’t compromises with aerodynamic requirements. There are three drivetrains available beneath the hood of Hyundai Ioniq 2017. 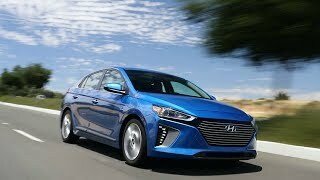 Starting with the hybrid versions of the 2017 Hyundai Ioniq, we have a 1.6 liter Kappa GDi gasoline engine that generates 104 hp and 147 nm. The engine combines with a 42.8 hp electric motor. Thus the system cranks total output of 139 hp and peak torque of 265 nm mating to six-speed dual-clutch transmission. 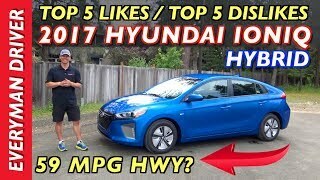 With this the top speed of Hyundai Ioniq 2017 touches the mark of 115 mph, however other performance figures of Hyundai Ioniq 2017 are still not shared but we expect to have them in near future.